“I think on the big spectrum of loot boxes, between ‘really good’ and ‘really evil,’ I’d like to think we’re more on that ‘really good’ side with what we’re trying to do,” says Overwatch game director Jeff Kaplan. As part of an interview at BlizzCon last weekend, I asked Kaplan about his response to the recent furor surrounding loot boxes. At their worst, they can throw off game balance, and no matter how you slice it, they take inspiration from gambling to siphon money out of players’ pockets. Kaplan said that the Overwatch team is constantly monitoring and reevaluating the game’s loot boxes in hopes of keeping them from making players feel crappy. Earlier this year, for example, Kaplan and company “drastically” reduced the chance that players will get duplicate items after cracking open a cold one, an update that came as a direct response to longtime player complaints. The Overwatch team’s response came later than players would’ve liked, and the end result is a system where duplicates still exist, but Kaplan argued that the team did everything it could. Still, that doesn’t address more fundamental concerns—namely, that loot boxes are inherently exploitative in a way that coaxes people into spending money and can ultimately create addicts, and also that they’re largely unrewarding gambling-esque systems duct-taped onto games that’d be more fun without them. Kaplan—whose game, it should be noted, makes a chunk of its sizable profits through loot boxes—said that he feels like Overwatch’s loot boxes avoid those pitfalls better than most. “When you talk about loot boxes, there’s a very wide spectrum of what games do with blind reveal systems,” he said. Overwatch’s loot boxes don’t give players additional power, he said, instead allowing them to do things like expose McCree’s glorious cowboy abs and turn Torbjorn into Santa Claus. A few exceptions aside, nearly every item that’s ever been in loot boxes can be earned by players without spending real money, Kaplan said—though many of those are trapped behind limited-time windows (and, as we all know, stored for the rest of the year in a vault in Kaplan’s terror palace). 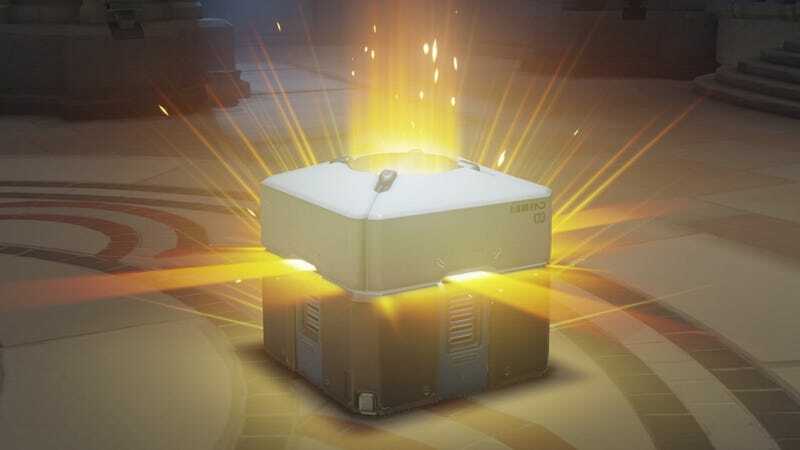 Even then, though, it’s likely that some people will continue loathing loot boxes, if only because they hold the potential to be infuriating, the spoiled icing atop the occasional frustrating play session. I asked Kaplan if, in light of all the recent anti-loot-box fervor, the team would ever consider removing loot boxes from Overwatch entirely. He replied that loot boxes will “probably” always stick around in some form, but never say never.